Narratives are a powerful feature in a world characterized by political uncertainty, cultural diversity and institutional complexity. With politics being increasingly described as ‘post-factual’ and ‘populist’, shaped by affect and fiction, narratives help make sense and meaningfully order political realities, forge collective identities and create normative guidance along future trajectories. Yet, narratives are not innocent, but the site of political contestation and a mode of politics. A narrative can bring people together, but it can also divide and fuel conflict. Where Western metanarratives, such as enlightenment, liberalism and progress, used to hold together entire civilizational units, they also functioned as a cover for violent practices. At the same time, they are internally contested and increasingly met by counter-narratives challenging the hegemonic position from which they originate. The outcome is a new complexity that reveals a polyphony of voices giving meaning to and seeking recognition on both the domestic and the international plane. Political narratives thus give expression to key ideational fault lines and to power struggles among agents claiming narrative authority. Is the prominence of narratives a new phenomenon, or have they always played a significant role in politics? If the latter, what is distinct about the current narrative landscape? What is a narrative and how does it ‘work’? What forms do narratives take and what are their functions? What makes a narrative ‘successful’? Why do some narratives resonate across multiple audiences and persist over time, while others lose their appeal? How can narrative help us think about and analyze power in global politics? How can narrative help us understand and render visible change (emergence, transformation or decay) of political order, institution, community, norm, identity, etc.? How does a narrative lens deal with epistemological questions about causality and truth? How does it help us cope with uncertainty, complexity and incomplete knowledge? How can we study the ambiguity of meaning and the polyphony of voices in one and the same narrative? What role do narratives play in the politics of defining what is ‘normal’ in global politics? What is the relationship between narrative analysis and discourse analysis? What is the relationship between narrative and practice? What place do narratives have in IR’s recent ‘turns’ (practice, aesthetics, temporal)? The workshop will bring together around 15 scholars and takes place from 26-27 August 2018 at the University of Hamburg, following the 2018 ECPR General Conference. Proposals from scholars at any level are welcome – PhD students at an advanced stage, postdoctoral and more senior researchers. A limited number of bursaries covering travel and accommodation expenses will be available for participants registered at UK/EU/European institutions (max. £200/person) and participants registered at non UK/EU/European institutions (max. £400/person) alike. Bursaries are allocated on the basis of need to those that have limited resources, though. If you wish to be considered for a bursary, please give two or three sentences of explanation for why you should be eligible for funding. Please note that successful recipients of a bursary must be registered members of BISA by the time of the workshop. 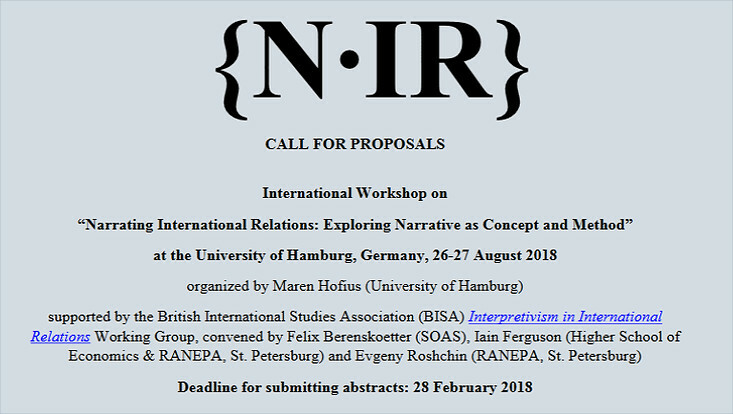 Abstracts (250 words) should be sent to maren.hofius@wiso.uni-hamburg.de by 28 February 2018. Authors will be informed about the selection outcome by the end of March. Confirmed participants will be asked to submit their papers two weeks before the workshop, i.e. by 12.08.2018 at the latest. To ensure thorough preparation and active participation, participants will be required to have read all papers and are assigned a discussant role for one specific paper. Please find the CfP as PDF here.